The 2016 Atlantic hurricane season was the first above-average hurricane season since 2012, producing 15 named storms, 7 hurricanes and 4 major hurricanes. The season officially started on June 1 and ended on November 30, though the first storm, Hurricane Alex which formed in the Northeastern Atlantic, developed on January 12, being the first hurricane to develop in January since 1938. The final storm, Otto, crossed into the Eastern Pacific on November 25, a few days before the official end. Following Alex, Tropical Storm Bonnie brought flooding to South Carolina and portions of North Carolina. Tropical Storm Colin in early June brought minor flooding and wind damage to parts of the Southeastern United States, especially Florida. Hurricane Earl left 94 fatalities in the Dominican Republic and Mexico, 81 of which occurred in the latter. In early September, Hurricane Hermine, the first hurricane to make landfall in Florida since Hurricane Wilma in 2005, brought extensive coastal flooding damage especially to the Forgotten and Nature coasts of Florida. Hermine was responsible for five fatalities and about $550 million (2016 USD) in damage. The 2012 Atlantic hurricane season was the final year in a consecutive string of three very active seasons, although many of the storms were weak. It is tied with 1887, 1995, 2010, and 2011 for having the third-most named storms on record. It was also the third-costliest season, behind 2005 and 2017. The season officially began on June 1 and ended on November 30, dates that conventionally delimit the period during each year in which most tropical cyclones form in the Atlantic Ocean. However, Alberto, the first system of the year, developed on May 19 – the earliest date of formation since Tropical Storm Ana in 2003. A second tropical cyclone, Beryl, developed later that month. This was the first occurrence of two pre-season named storms in the Atlantic basin since 1951. It moved ashore in North Florida on May 29 with winds of 65 mph (100 km/h), making it the strongest pre-season storm to make landfall in the Atlantic basin. This season marked the first time since 2009 where no tropical cyclones formed in July. Another record was set by Hurricane Nadine later in the season; the system became the fourth-longest-lived tropical cyclone ever recorded in the Atlantic, with a total duration of 22.25 days. The final storm to form, Tony, dissipated on October 25 – however, Hurricane Sandy, which formed before Tony, became extratropical on October 29. The Azores, officially the Autonomous Region of the Azores, is one of the two autonomous regions of Portugal. It is an archipelago composed of nine volcanic islands in the North Atlantic Ocean about 1,360 km (850 mi) west of continental Portugal, about 1,643 km (1,021 mi) west of Lisbon, in continental Portugal, about 1,507 km (936 mi) northwest of Morocco, and about 1,925 km (1,196 mi) southeast of Newfoundland, Canada. Hurricane Alice is the only known Atlantic hurricane to span two calendar years and one of only two named Atlantic tropical cyclones, along with Tropical Storm Zeta of 2005, to do so. The twelfth tropical cyclone and the eighth hurricane of the 1954 Atlantic hurricane season, Alice developed on December 30, 1954 from a trough of low pressure in the central Atlantic Ocean in an area of unusually favorable conditions. The storm moved southwestward and gradually strengthened to reach hurricane status. After passing through the Leeward Islands on January 2, 1955, Alice reached peak winds of 90 mph (150 km/h) before encountering cold air and turning to the southeast. It dissipated on January 6 over the southeastern Caribbean Sea. The 1954 Atlantic hurricane season resulted in over $750 million in damage, the most of any season at the time. The season officially began on June 15, and nine days later the first named storm developed. Hurricane Alice developed in the Gulf of Mexico and moved inland along the Rio Grande, producing significant precipitation and record flooding that killed 55 people. Activity was slow until late August; only Barbara, a minimal tropical storm, developed in July. In the span of two weeks, hurricanes Carol and Edna followed similar paths before both striking New England as major hurricanes. The latter became the costliest hurricane in Maine's history. A low-pressure area, low, depression or cyclone is a region on the topographic map where the atmospheric pressure is lower than that of surrounding locations. Low-pressure systems form under areas of wind divergence that occur in the upper levels of the troposphere. The formation process of a low-pressure area is known as cyclogenesis. Within the field of meteorology, atmospheric divergence aloft occurs in two areas. The first area is on the east side of upper troughs, which form half of a Rossby wave within the Westerlies. A second area of wind divergence aloft occurs ahead of embedded shortwave troughs, which are of smaller wavelength. Diverging winds aloft ahead of these troughs cause atmospheric lift within the troposphere below, which lowers surface pressures as upward motion partially counteracts the force of gravity. Terceira is an island in the Azores archipelago, in the middle of the North Atlantic Ocean. It is one of the larger islands of the archipelago, with a population of 56,000 inhabitants in an area of approximately 396.75 square kilometres. It is the location of the Azores' oldest city, Angra do Heroísmo, the historical capital of the archipelago and UNESCO World Heritage Site; the seat of the judicial system ; and the main base of the Azores Air Zone Command, Base Aérea nº 4, and a United States Air Force detachment. 08:00 UTC (4:00 a.m. EDT) at 30°36′N83°48′W﻿ / ﻿30.6°N 83.8°W﻿ / 30.6; -83.8﻿ (Hurricane Hermine weakens to a tropical storm) – Hurricane Hermine weakens to a tropical storm about 30 miles (50 km) east-northeast of Tallahassee, Florida. ↑ The figures for maximum sustained winds and position estimates are rounded to the nearest 5 units (knots, miles, or kilometers), following the convention used in the National Hurricane Center's operational products for each storm. All other units are rounded to the nearest digit. The 1989 Atlantic hurricane season was an average season with 11 named storms. The season officially began on June 1, and ended on November 30. The first storm, Tropical Depression One, developed on June 15, and dissipated two days later without effects on land. Later that month, Tropical Storm Allison caused severe flooding, especially in Texas and Louisiana. Tropical Storm Barry, Tropical Depressions Six, Nine, and Thirteen, and Hurricanes Erin and Felix caused negligible impact. Hurricane Gabrielle and Tropical Storm Iris caused light effects on land, with the former resulting in nine fatalities from rip currents offshore the East Coast of the United States and Atlantic Canada, while the latter produced minor flooding in the United States Virgin Islands. The Atlantic hurricane season of 2008 was the first such year to feature a major hurricane in every month from July to November. The timeline includes information that was not operationally released, meaning that data from post-storm reviews by the National Hurricane Center, such as information about a storm that was not operationally warned on, has been included. Although Tropical Storm Arthur formed on May 30, 2008, the season officially began on June 1 and ended on November 30, dates that conventionally delimit the period of each year when most tropical cyclones develop in the Atlantic basin. The season's final storm, Hurricane Paloma, dissipated on November 10. The 1995 Atlantic hurricane season was a very active year in which nineteen named storms formed, tying it with the seasons of 1887, 2010, 2011, and 2012 for the third most active hurricane season on record. The season officially began on June 1, with the first tropical cyclone, Hurricane Allison, forming just the next day. The season ended on November 30. These dates conventionally delimit the period of each year when most tropical cyclones develop in the Atlantic basin. The season's last storm, Hurricane Tanya, dissipated on November 3. The 2001 Atlantic hurricane season was an above-average Atlantic hurricane season in which fifteen named storms formed. The season officially began on June 1 and ended on November 30, dates that conventionally delimit the period of each year when most tropical cyclones form in the Atlantic basin. The season's first tropical cyclone, Tropical Storm Allison, formed on June 5 while the season's final system, Hurricane Olga, dissipated on December 6. The 1994 Atlantic hurricane season was a below-average Atlantic hurricane season that produced seven named tropical cyclones. The season officially began on June 1 and ended on November 30, dates which conventionally limit the period of each year when tropical cyclones tend to form in the Atlantic. The first named storm, Tropical Storm Alberto, formed on June 30. The last storm of the season, Hurricane Gordon, dissipated on November 21. This timeline documents tropical cyclone formations, strengthening, weakening, landfalls, extratropical transitions, as well as dissipation during the season. The timeline also includes information which was not operationally released, such as post-storm reviews by the National Hurricane Center. The 2009 Atlantic hurricane season was a below-average year in which nine tropical storms formed, the fewest since 1997. Although Tropical Depression One formed on May 28, 2009, the season officially began on June 1 and ended on November 30. The season's last storm, Hurricane Ida, dissipated on November 11. 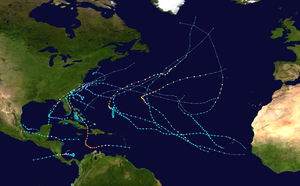 The 1987 Atlantic hurricane season was a below-average season, having fewer named storms than in a normal year, that resulted in little impact throughout the Atlantic basin; the United States recorded no hurricane-related fatalities, making the 1987 season the fourth to do so since 1976. The season officially began on June 1, 1987 and ended on November 30; however, a pre-season storm, Tropical Depression One, led to the season's starting on May 25. Storm activity ended several weeks early; the final storm of the season, Tropical Depression Fourteen, dissipated on November 4. This timeline includes information that was not operationally released, meaning that information from post-storm reviews by the National Hurricane Center, such as a storm that was not operationally warned upon, has been included. This timeline documents tropical cyclone formations, strengthening, weakening, landfalls, extratropical transitions, as well as dissipations during the season. The 1998 Atlantic hurricane season was an above-average Atlantic hurricane season in which fourteen named storms, ten hurricanes, and three major hurricanes formed. Although Tropical Storm Alex formed on July 27, the season officially began on June 1 and ended on November 30, dates that conventionally delimit the period of each year when most tropical cyclones develop in the Atlantic basin. The final storm, Hurricane Nicole, lasted until December 1, one day after the official end of the season. The 2002 Atlantic hurricane season was an average Atlantic hurricane season in which twelve named storms formed. Although Tropical Storm Arthur formed on July 14, the season officially began on June 1 and ended on November 30, dates that conventionally delimit the period of each year when most tropical cyclones develop in the Atlantic basin. The season's final storm, Tropical Depression Fourteen, dissipated on October 16. The 1990 Atlantic hurricane season featured the most named storms of any hurricane season at the time. During the season, 14 tropical cyclones in the Atlantic Ocean became named storms. Although Tropical Depression One formed on May 24, the season officially began on June 1; it ended on November 30, dates that conventionally delimit the period of each year when most tropical cyclones develop in the Atlantic basin. The season's final storm, Hurricane Nana, dissipated on October 21. The 2010 Atlantic hurricane season was one of the most active Atlantic hurricane seasons since records began in 1851 in which nineteen named storms formed. The season officially began on June 1 and ended on November 30, dates that conventionally delimit the period of each year when most tropical cyclones develop in the Atlantic basin. The season's final storm, Hurricane Tomas, dissipated on November 7. The 1985 Atlantic hurricane season featured eight landfalling tropical cyclones in the United States, including a record-tying six hurricanes, the most in a single year since 1916. The season officially started on June 1 and lasted until November 30. These dates typically cover the period of each year when most tropical cyclones form in the Atlantic basin. The season's first storm, Tropical Storm Ana, developed on July 15; the season's final storm, Tropical Depression Thirteen, dissipated on December 9. The 2011 Atlantic hurricane season was well above average in the number of tropical cyclones that formed, at nineteen. It was also the first time that the first eight tropical cyclones of the season failed to attain hurricane status. Although Tropical Storm Arlene formed on June 28, the season officially began on June 1 and ended on November 30, dates that conventionally delimit the period of each year when most tropical cyclones develop in the Atlantic basin. The season's final storm, Tropical Storm Sean, dissipated on November 11. The 2012 Atlantic hurricane season featured the third-most named storms for the third consecutive year on record. Though the season officially began on June 1 and ended on November 30, dates which conventionally delimit the period of each year when most tropical cyclones develop in the Atlantic basin, two storms – Alberto and Beryl – developed before the official start, on May 19 and May 26, respectively; this was the first such occurrence since the 1908 season. The season's final storm to form, Tony, dissipated on October 25, although the previous cyclone, Sandy, did not do so until four days later. The 2013 Atlantic hurricane season was a below-average season, featuring the fewest hurricanes since 1982. Although Tropical Storm Andrea formed on June 5, the season officially began on June 1 and ended on November 30, dates that conventionally delimit the period of each year when most tropical cyclones develop in the Atlantic basin. The season's final storm, an unnamed subtropical storm, dissipated on December 7. The 2014 Atlantic hurricane season was a below-average Atlantic hurricane season, featuring the fewest number of named storms since 1997. The season officially began on June 1 and ended on November 30, dates that conventionally delimit the period of each year when most tropical cyclones develop in the Atlantic basin. The season's first storm, Hurricane Arthur, developed on July 1; the season's final storm, Tropical Storm Hanna, degenerated on October 28. The 2015 Atlantic hurricane season was the third consecutive year to feature below-average activity, with eleven named storms. The season began on June 1 and ended on November 30, dates adopted by convention that historically describe the period in each year when most tropical cyclones form in the Atlantic basin. The season's first storm, Tropical Storm Ana, developed on May 8; the season's final storm, Hurricane Kate, lost its tropical characteristics on November 11. The 2017 Atlantic hurricane season was an event in the annual tropical cyclone season in the North Hemisphere. The season officially began on June 1, 2017 and ended on November 30, 2017. These dates, adopted by convention, historically describe the period in each year when most systems form. However, systems can and do form outside these dates, such as Tropical Storm Arlene which formed on April 19. The 2018 Atlantic hurricane season was an event in the annual tropical cyclone season in the Northern Hemisphere. The season officially began on June 1, 2018 and ended on November 30, 2018. These dates, adopted by convention, historically describe the period in each year when most systems form. However, systems can and do form outside these dates, shown by the formation of Subtropical Storm Alberto on May 25. ↑ First above-normal Atlantic hurricane season since 2012 produced five landfalling U.S. storms (Report). National Oceanic and Atmospheric Administration. November 30, 2016. Archived from the original on April 28, 2017. Retrieved May 7, 2017. ↑ Hurricane Season 2016 (Report). 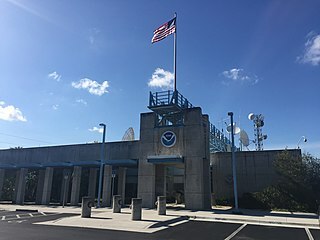 Cayman Islands National Weather Service. Retrieved May 7, 2017. 1 2 3 Christopher W. Landsea; Neal Dorst; Erica Rule (June 2, 2011). "G: Tropical Cyclone Climatology". Hurricane Research Division: Frequently Asked Questions. Atlantic Oceanographic and Meteorological Laboratory . National Oceanic and Atmospheric Administration. G1) When is hurricane season ?. Archived from the original on June 15, 2006. Retrieved January 22, 2016. 1 2 3 4 5 6 7 8 9 10 11 Daniel P. Brown (January 30, 2017). Tropical Cyclone Report: Hurricane Otto (PDF) (Report). Miami, Florida: National Hurricane Center. pp. 1,2,8,9. Archived (PDF) from the original on April 28, 2017. Retrieved February 3, 2017. ↑ Bob Henson (January 15, 2016). "Astounding Alex Hits the Azores: January's First Atlantic Landfall in 61 Years". Weather Underground. Archived from the original on January 21, 2016. Retrieved January 22, 2016. ↑ Dr. Jeff Masters (June 5, 2016). "Tropical Storm Colin Becomes Earliest "C" Storm in Atlantic History". Weather Underground. Archived from the original on November 26, 2016. Retrieved September 18, 2016. ↑ Dr. Jeff Masters; Bob Henson (June 20, 2016). "Danielle the Atlantic's Earliest 4th Storm on Record; 115°-120° Heat in SW U.S." Weather Underground. Archived from the original on November 9, 2016. Retrieved September 18, 2016. ↑ Jon Erdman (September 2, 2016). "Hurricane Hermine Ends Florida's Record-Smashing Hurricane Drought". The Weather Channel. Archived from the original on September 17, 2016. Retrieved September 18, 2016. 1 2 3 4 5 6 7 8 9 10 11 12 13 14 15 16 17 18 19 Stacy R. Stewart (April 7, 2017). Tropical Cyclone Report: Hurricane Matthew (PDF) (Report). Miami, Florida: National Hurricane Center. pp. 2–5, 27–29. Archived (PDF) from the original on April 5, 2017. Retrieved April 12, 2017. 1 2 3 4 5 6 7 8 9 10 11 12 13 14 15 16 Todd B. Kimberlain; Andrew S. Latto (February 15, 2017). Tropical Cyclone Report: Hurricane Nicole (PDF) (Report). Miami, Florida: National Hurricane Center. pp. 2,3,8,9. Archived (PDF) from the original on February 17, 2017. Retrieved February 16, 2017. 1 2 3 4 5 6 Eric S. Blake (September 13, 2016). Tropical Cyclone Report: Hurricane Alex (PDF) (Report). Miami, Florida: National Hurricane Center. pp. 1,2,5,6. Archived (PDF) from the original on February 3, 2017. Retrieved February 1, 2017. 1 2 3 4 5 6 7 8 9 10 11 Michael J. Brennan (October 14, 2016). Tropical Cyclone Report: Tropical Storm Bonnie (PDF) (Report). Miami, Florida: National Hurricane Center. pp. 1,2,3,6,7,8. Archived (PDF) from the original on February 3, 2017. Retrieved February 4, 2017. 1 2 3 4 5 Richard J. Pasch; Andrew B. Penny (January 17, 2017). Tropical Cyclone Report: Tropical Storm Colin (PDF) (Report). Miami, Florida: National Hurricane Center. pp. 2,6. Archived (PDF) from the original on January 28, 2017. Retrieved February 4, 2017. 1 2 3 4 5 6 John L. Beven II (September 8, 2016). Tropical Cyclone Report: Tropical Storm Danielle (PDF) (Report). Miami, Florida: National Hurricane Center. pp. 2,5. Archived (PDF) from the original on February 3, 2017. Retrieved February 5, 2017. 1 2 3 4 5 6 7 8 Stacy R. Stewart (January 19, 2017). Tropical Cyclone Report: Hurricane Earl (PDF) (Report). Miami, Florida: National Hurricane Center. pp. 2,8. Archived (PDF) from the original on January 27, 2017. Retrieved February 5, 2017. 1 2 3 4 5 Todd B. Kimberlain (November 11, 2016). Tropical Cyclone Report: Tropical Storm Fiona (PDF) (Report). Miami, Florida: National Hurricane Center. pp. 5, 6. Archived (PDF) from the original on February 3, 2017. Retrieved February 17, 2017. 1 2 3 4 5 6 7 8 9 10 11 12 13 14 Daniel P. Brown (January 11, 2017). Tropical Cyclone Report: Hurricane Gaston (PDF) (Report). Miami, Florida: National Hurricane Center. pp. 2,3,6,7. Archived (PDF) from the original on April 28, 2017. Retrieved April 10, 2017. 1 2 John P. Cangialosi (December 6, 2016). Tropical Cyclone Report: Tropical Depression Eight (PDF) (Report). Miami, Florida: National Hurricane Center. pp. 2,5,6. Archived (PDF) from the original on April 28, 2017. Retrieved April 10, 2017. 1 2 3 4 5 6 Robbie J. Berg (January 30, 2017). Tropical Cyclone Report: Hurricane Hermine (PDF) (Report). Miami, Florida: National Hurricane Center. pp. 2,3,12,13. Archived (PDF) from the original on April 27, 2017. Retrieved April 10, 2017. 1 2 3 4 5 Lixion A. Avila (January 3, 2017). Tropical Cyclone Report: Tropical Storm Ian (PDF) (Report). Miami, Florida: National Hurricane Center. pp. 2,4. Archived (PDF) from the original on April 28, 2017. Retrieved April 11, 2017. 1 2 3 4 5 6 Eric S. Blake (January 20, 2017). Tropical Cyclone Report: Tropical Storm Julia (PDF) (Report). Miami, Florida: National Hurricane Center. pp. 2,3,5,6. Archived (PDF) from the original on April 28, 2017. Retrieved April 11, 2017. 1 2 3 4 5 6 7 Richard J. Pasch; David A. Zelinsky (January 4, 2017). Tropical Cyclone Report: Tropical Storm Karl (PDF) (Report). Miami, Florida: National Hurricane Center. pp. 2,5,6,7. Archived (PDF) from the original on April 28, 2017. Retrieved April 11, 2017. 1 2 3 4 5 John L. Beven II (February 3, 2017). Tropical Cyclone Report: Tropical Storm Lisa (PDF) (Report). Miami, Florida: National Hurricane Center. pp. 2,5,6. Archived (PDF) from the original on April 13, 2017. Retrieved April 12, 2017. Wikimedia Commons has media related to 2016 Atlantic hurricane season .